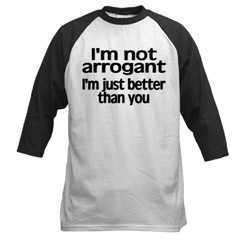 To be honest, successful selling requires a degree of, for lack of a better word, arrogance. You must believe in your opinion and philosophy more than anyone else, and, at times, when there is no hard evidence to support your point of view. I am a huge detractor of the adversarial school of selling. I firmly believe that the selling should be collaborative and supportive. However, there are critical points in the sales process (typically very early and about 2/3rds of the way through) where a salesperson must have the confidence to assert their opinion and to control the agenda. At the beginning of the process, you must be confident enough in your knowledge of what’s going wrong in a prospect’s world to overcome their doubt and lead them to that awareness. This isn’t as difficult as it sounds. You’ve got the experience to know the most common problems that are occurring – you just need the confidence to assert that opinion. Next, the vast majority of sales opportunities hit a point where the sale looks as though it’s going “off the tracks.” Complexity is setting in, buyers aren’t responding as fast as you’d like, and to make matters worse, they’re misunderstanding just about every action item you’ve given them. Budgets appear limited and, as a salesperson, you get that horrible feeling in your gut. This is the time to assert your command and control the process. I’ve learned that Command is not easily taught. I’ve also learned that anyone can have it. It’s simply a choice – are you ready to make it?